Even while maintaining an overall compact form-factor, the D5300 integrates a large 3.2" 1,037k-dot vari-angle LCD monitor, which features a 180° swivel design to better suit working from high, low, and front-facing angles. Alternatively, a bright pentamirror optical viewfinder is also integrated into the design for precise eye-level viewing and real-time monitoring of subjects. Included with the camera body is the standard zoom AF-S DX NIKKOR 18-55mm f/3.5-5.6G VR II lens, which provides a 35mm-equivalent focal length range of 27-82.5mm. Designed to be as compact and lightweight as possible, this lens features a retractable lens barrel design that extends 2.6" from the camera. Benefitting the low-light imaging capabilities of the D5300, VR (Vibration Reduction) technology is incorporated into the lens' design to provide up to 4 stops of compensation against camera shake for cleaner, clearer imagery. Additionally, a Super Integrated Coating (SIC) has also been applied to lens elements to maintain true color fidelity and contrast by suppressing flare and ghosting. Box Dimensions (LxWxH) 8.7 x 6.6 x 5.4"
D5300 DSLR Camera with 18-55mm Lens (Black) is rated 4.7 out of 5 by 85. Rated 5 out of 5 by Dorine K. from Great Entry Level Camera Bundle-Great Buy! This camera shoots sharp, clear and rich color photographs. it's the perfect entry level camera to learn Nikon DSLR functions. The 9, 21 and 39-point Dynamic-area auto focus, 3D tracking and DX sensor are very useful for wildlife photography assuming you also consider purchasing a zoom telephoto lens like the 70-300mm. The 18-55mm vibration reduction kit lens is a great starter lens that is very useful for landscape and architectural photographs as well as portraits. The 24 mp is perfect for a beginner to enthusiast level photographer. Rated 5 out of 5 by photosbypjt from Great quality photos, compact size, great price I am a professional photographer based in Arlington, Virginia. I have had Nikon cameras for over 30 years. The D5300 replaced a Nikon D7000. It's smaller, with higher resolution, better quality at higher ISO settings. The built in WIFi means I can control the camera from my smart phone. So far I have no complaints at all - I really like this camera. The Nikkor 18-55mm VRll lens is really sharp - a fantastic bargain. Rated 5 out of 5 by mlharrissr from Fantastic For SO Many Reasons I owned a D5100 before I bought this camera. I'm a commercial professional photographer; but I also teach photography at a local art center. My students were intimidated by my pro level cameras, so I thought I would purchase an entry level camera with a kit lens and see what they were seeing. I really liked the D5100 for many reasons. But I noticed because of the processor, it didn't have great print results at higher ISO. Also the video auto focus except for subjects standing still, was not good. When Nikon came out with the D5500, I knew the D5300 would be available at a bargain price so I bought it, primarily because of the new advanced xpeed processor. I was not disappointed. On my first test shots, the results were amazing. I tested it for two weeks in every type of shooting situation; and it performed magnificently I like the light weight. I'm currently working on a project for a one man show, (involving street photography); and this camera is perfect for quick, candid shots. It's quieter than the D5100 and at 24 Megapixels, with the Xpeed 4 processor, delivers amazing quality in prints. It was a bonus that the video and auto focus has been tremendously improved in the D5300. The image stabilization in that is more than acceptable. I shoot some commercial video and this fits the bill for that. I'm thinking about purchasing another one, I like it so much. Rated 5 out of 5 by A Couple of Coynes from Loving this little red beauty! I am an entry-level photo enthusiast who wanted a camera that I could grow into...and this is it! My husband and I have been capturing amazing photos already with just the standard settings and we're going to do some workshops for the more advanced settings as we learn more over time. So far, we have been very pleased with the: speed of the camera...very fast...especially in sports mode, wi-fi connectivity...a wonderful option which allows me to take some great photos and send them to friends and family that day...instead of the typical waiting period of downloading them to the computer and then sending them out, and picture clarity is excellent! This camera packs a lot in a lightweight and striking package! So far we have been loving it! Rated 4 out of 5 by Anonymous from Great Camera Great camera. I recently upgraded from the D5000. The D5000 was a great camera, but they really improved on it with this model. Image quality is great. Biggest improvement for me is the video quality. Just stunning video. And with the addition of the mic input (thank you!) you can shoot some pretty high quality stuff. Only complaints are the 10 minute video limit (would love to record some seminars but can't because of the 10 minute limit) and only 1 scroll wheel. 2 scroll wheels would take this to the next level. Rated 5 out of 5 by MariusInMD from Love it all the way around! Going from a D40 to this was a big step but still a breeze. Controls were familiar and easy to find. New features were easy to figure out with the always well documented directions / manual from Nikon. My first trip outside I was asked 5 minutes before a 5 mile race to photograph it! With the included 18-55 I was able to get crisp, rich, vivid photos and HD video to die for. I am extremely happy with all aspects of the camera! The Wi-Fi is especially easy to figure out on the iPhone + App and gives you immediate satisfaction being able to share photos! Also, the night photos are amazing! It's like the room is lit up!! Rated 5 out of 5 by Sir_Joe from Best Mid Range Camera I have had this camera for over a month and I have been able to take some outstanding photos! The 24 megapixel censor takes detailed photos and I have already made three large prints that came out great. Shooting in low light is amazing, being able to go to ISO 3200 without much noise (which can easily be removed by Lightroom or other software). The tilt screen helps so much the first week I had used it to frame half of my shots easily when before it would be much harder. The GPS is TERRIBLE it would take forever to get a lock and then losing it right away, also WiFi is not really useful unless you like to view your photos on a tablet or to frame a shot. I love being able to shoot 14-Bit Raw and the 1080p 60Fps video. Overall this camera is the best mid range DSLR without spending way too much and having many features in a small lightweight design. Rated 5 out of 5 by yikesboy from Brilliant pictures and excellent UX! Bought this beast for my wife and she loves it. Super easy to navigate and coming from a Canon Rebel (4 years old), the difference in picture quality and speed is really gratifying. We will likely get a new lens at some point but the stock one captures images well with great detail. Autofocus seems super solid as well. All in all reality happy with the purchase, the bundle, and B&H experience. A few days ago it said that the camera came with a bag and an sd card. Is that still part of the order? As of the date of this reply, at this time, the Nikon D5300 DSLR Camera with 18-55mm Lens (Black), B&amp;H # NID53001855B, does not include a carrying case or a memory card. The Nikon D5300 DSLR Camera with 18-55mm and 55-300mm Lenses Kit (Black), B&amp;H # NID5300DLWFC, does include a faux leather bag, a 32GB memory card, and SD card Holder, and a DVD, but the standard single lens kit does not currently include any additional free accessories. What's the difference between the Nikon d5300 that says it's imported and the one that doesn't say? Items marked Imported are imported and/or distributed by other entities and are warranted by B&amp;H Photo-Video. Imported products do not qualify for manufacturer's rebate programs.There is no difference in the item itself. You can read more information on Imported items by clicking the link inside the (?) symbol next to the word Imported on our website. Does the camera had a Bulb mode for astrophotography? Taking video, set on Auto mode and auto focus, and using the 18-55 mm VR II, the video is picking up quite a bit of scratching or crackling like noise as the lens hunts for focus. I'm wondering, is this normal, as the lens seems fine otherwise? Other than to set focus on manual, or use an external mike, any other suggestions? Unfortunately, this is normal. Photography lenses like this one may not be perfectly suited for shooting video, as you've experienced with the noisy focus motor. In photography the noise of the motor is not an issue, but now that the cameras have video features added in the system isn't ideal and manual focus would be recommended. Otherwise, you'll need to upgrade the lens for those made with video in mind that use quieter motors, or have no electronics, instead. I have read that these cameras tend to have a lot of noise from the AF motors in the lenses. I am interested in using this to create YouTube content, but if there is indeed excess noise from the camera I don't feel it would be suitable for that, especially with a rode mic mounted right above the camera. Does anyone have experience with using these specifically for video creation? Thanks! I purchased mine about 2-3 years ago, so my purchasing experience is not relevant. At that time, it was the camera with one 18-55 kit lens. My wife bought a kit with case and lens. So it varies. The case I bought was not expensive and served me well. Neither of us got sad cards as part of the deal.I will add that we both are VERY pleased with the camera. Will the Nikon DX, AF-S NIKKOR 55-200mm work on this body including the auto focus? All Nikon AF-S lenses would be fully compatible for use on the Nikon D5300 DSLR camera. As such, the original Nikon AF-S DX Zoom-NIKKOR 55-200mm f/4-5.6G ED Lens, B&amp;H # NI55200GAF, the Nikon AF-S DX VR Zoom-NIKKOR 55-200mm f/4-5.6G IF-ED Lens, B&amp;H # NI5520045GAF, and the current Nikon AF-S DX NIKKOR 55-200mm f/4-5.6G ED VR II Lens, B&amp;H # NI5520045, all are fully compatible for use with the Nikon D5300 DSLR camera. 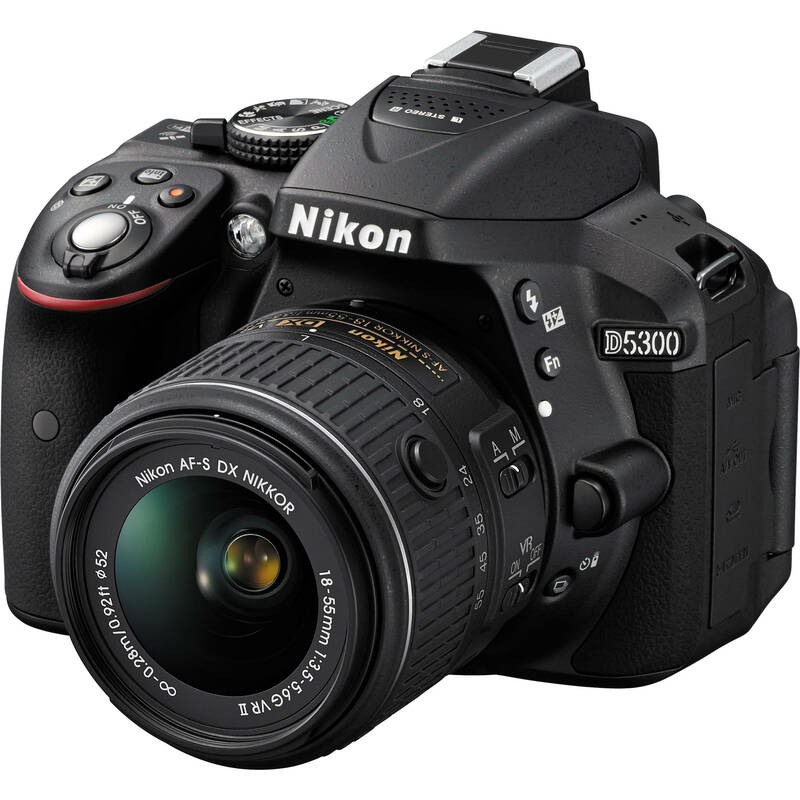 The AF-S designation indicates the lens has Nikon's Silent Wave Motor built inside the lens, and as such, would autofocus on the Nikon D5300 DSLR camera. I need a Wide angle lens for indoor &amp; outdoor shots for a real estate shoot. Which lens either a Sigma or a Nikon? Use Sigma 10-14mm for Real Estate and its great. Paid about 500 for lense.